All Australia service providers APN setting for Android- list.APN setting is necessary when you want to run internet on your mobile phone using the services provided by your Cellular Network service provider (Carrier). In general, APN setting is being provided by Cellular Service provider but if you have any problem associated with the APN settings received then you can also set it manually with ease. Almost all APN settings have same fields but the value corresponding to those fields may differ based on some parameters. Step 1: Select Settings in your android device. Step 3: Now tap Access Point Names (APN). Step 4: Tap New APN in Menu and you will see screen as shown below. 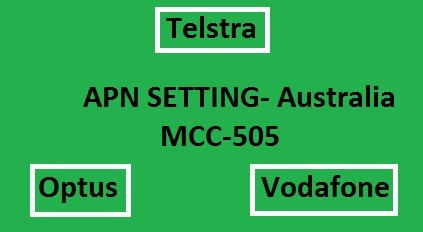 All Australia service providers APN setting for Android- list. hope you liked this article and if you have any queries then do comment below. Disclaimer: Although, we have taken utmost care in gathering all the above APN setting info of Australian service provider from our reliable resources and our own research but we are not responsible for any inconsistency and inconvenience in accessing internet as we not a part of any of the service provider.